KEY MOMENT: With the score tied, 1-1, the Mariners loaded the bases off Jason Grilli with no outs in the ninth when Kyle Seager reached on an infield single, Logan Morrison walked and Chavez beat out a sacrifice bunt. But Grilli, with the Angels employing a five-man infield, struck out Brad Miller and Chris Taylor and got Austin Jackson to fly to right, ending the inning. But Miller would score in the 11th on a fielder's choice to second by Jackson to give the Mariners a 2-1 victory. AT THE PLATE: Howie Kendrick had a double and single in four at-bats and is hitting .417 with seven doubles, two homers, two triples, 13 runs and 19 RBIs in his last 21 games. The Angels scored in the second when David Freese doubled, Chris Iannetta was hit by a pitch and C.J. Cron grounded an infield single off the glove of Seager, the Seattle third baseman. ON THE MOUND: C.J. 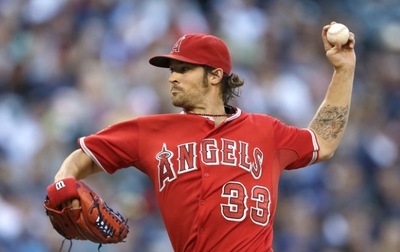 Wilson eased the concerns of many Angels fans and probably his manager and pitching coach with a strong six-inning start, in which he allowed one run and four hits, walked three and struck out two. Wilson did not allow a runner to second until the sixth inning, when he pitched his way out of a two-on, one-out jam. Of his 85 pitches, 46 were strikes. 2/3innings of an 8-4 loss in Oakland on Monday night. TIMING IS EVERYTHING: Just as Oakland lost in Texas, Seager walked and Morrison hit a run-scoring double to right-center in the seventh to pull the Mariners even, 1-1. Angels reliever Fernando Salas replaced Wilson, and Endy Chavez's sacrifice bunt moved Morrison to third. Pinch-hitter Michael Saunders was intentionally walked, and Salas struck out Taylor and Jackson to snuff out the threat. IN THE FIELD: The Mariners put two on with one out in the sixth when Taylor singled and Ackley was hit by a pitch. But Angels shortstop Erick Aybar made a nice sliding, backhand stop of Robinson Cano's sharp one-hopper and threw to second for a forceout, and Wilson got Kendrys Morales to fly to left, as the Angels preserved a 1-0 lead. Aybar and Kendrick teamed up to turn double plays in the second and third innings. UP NEXT: Right-hander Cory Rasmus (3-1, 2.38 ERA) will oppose Seattle right-hander Felix Hernandez (14-6, 2.34 ERA) at Safeco Field today at 1 p.m. On the air: TV: FS West. Radio: 830.